Foxtel is considered one of Australia's most progressive and dynamic media companies delivering a diverse subscription television service to both regional and metropolitan areas over cable, satellite and broadband distribution. 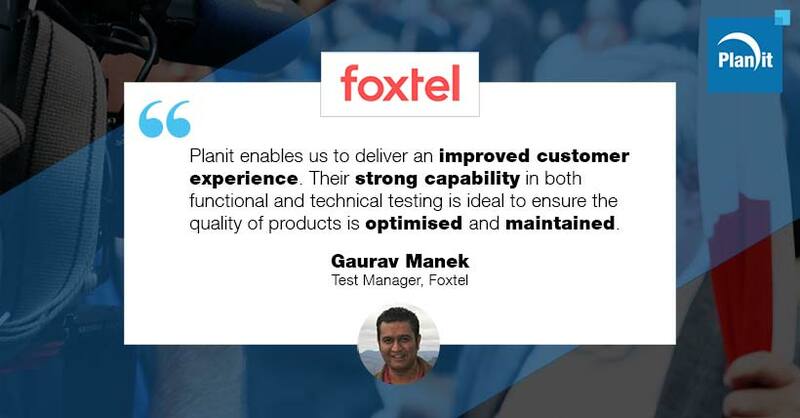 Foxtel’s stated goal is enabling “every Australian to be able to find something on TV they want to watch every time they switch on.” Planit aids Foxtel’s two Customer Solutions Centres in the delivery of this goal through quality across technical projects. “As the test manager based in the Melbourne centre, our partnership with Planit has developed over the last six years. When we need test managers, lead testers, or test analysts, Planit ramped up for us immediately. “Their responsiveness, and technically high skillsets across all the dedicated consultants and methodologists, have enabled me to rely on them and they’ve been our first port of call for over three years. The people are the right fit for us, both from the skillset and culture perspectives, and I’d definitely recommend them as the best choice. “With Planit, everything we do is delivered on time, with excellent quality, and they keep within our budget, saving us both time and money. Their internal processes enable continuous improvement of their people’s skills and knowledge, which is to our benefit. “We encourage innovative thinking, and Planit’s people have the capacity to give us innovative testing processes. They also ensure we deliver to our clients and work to exceed their expectations. “Visibility of a project’s risk position is definitely increased by Planit’s testing. For example, a test analyst highlighted some gaps on one project that saved us from what would have been a major problem at considerable cost to us. “As the requirements arise, Planit partners with us to meet our needs and have done so many times. It doesn’t matter how long the project is for, as Planit will go the distance. Their resources have the capability to be proactive and introduce improvements to accelerate our delivery. “Planit enables us to deliver an improved customer experience, which is particularly important for our brand and reputation. Their strong capability in both functional and technical aspects of testing is ideal to ensure the quality of products is optimised and maintained.